Comparing the two by flicking back and forth I think the 18mm opening has the more classic line and keeps the face prominent on the overall design - this is important if the hand set remains to the original proportions. My opinion of course. I’m still of the opinion that the tip of the minute and second hand should reach the markers. Last edited by lughugger; 12th August 2018 at 09:27. 35mm.....OMG so nice , I want!!! I've decided it should be 36mm with 20mm lugs. Agreed. Hands are definitely too short. And a longer counterbalance on the seconds hand would be nice... Come on, Eddie, you know it makes sense! Excellenti!! When might this be available? The minute hand, I'll agree. But still needs another mm on the hour hand with same on the seconds hand counterbalance. Then we can talk about perfection. Exceedingly tempted by the 36mm! 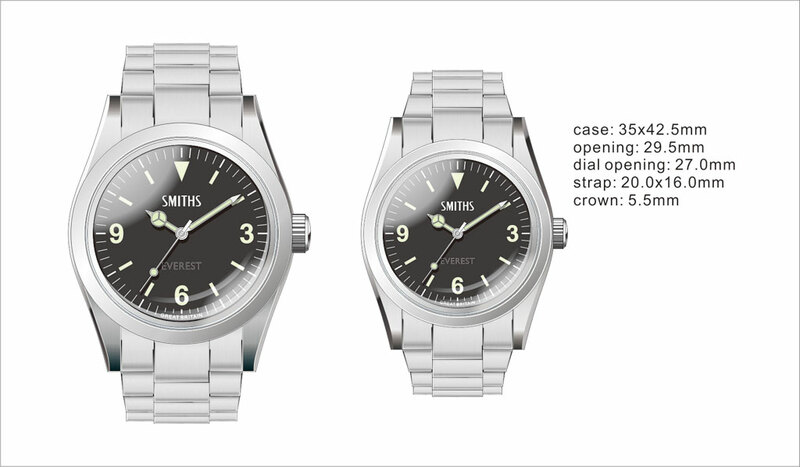 The dial is slightly too small; the dial of a 1016 is 28mm, not 27mm as you have it now. I know it's only 1mm but it does not look entirely right with 27mm. 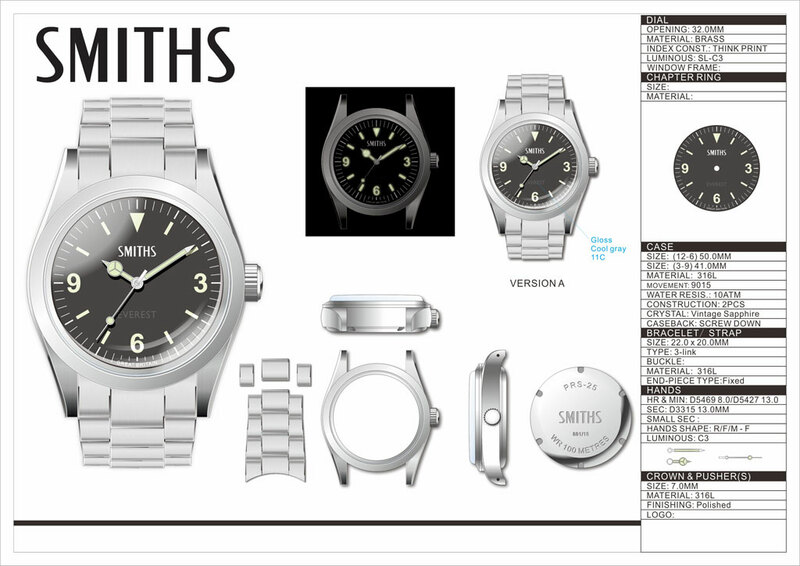 Other than that it looks very nice although I would love to see it with the old Smiths De Luxe logo and Everest in white letters. Totaly agree with you! The old-school Smiths Deluxe logo would be awesome. But either way i will definitely order! So when in the dark the hands shrink? That's a complication I haven't seen before! Eddie. can you confirm on the original 1016 did the bracelet taper from 20mm to 16mm or 20mm to 18mm? I really want a PRS-25, this has just muddied the waters. I was always concerned the original would appear too big and consequently never took the plunge, i'm hoping this will be the perfect fit. Judging by the pictures of the 36mm Zeno it seems well proportioned (if that's a good comparison). Will these be a limited run? I think it tapered to 16 but the adjustable clasp isn't available in 16mm. 36 mm with longer hands. Excellent move!!! I think it looks great. 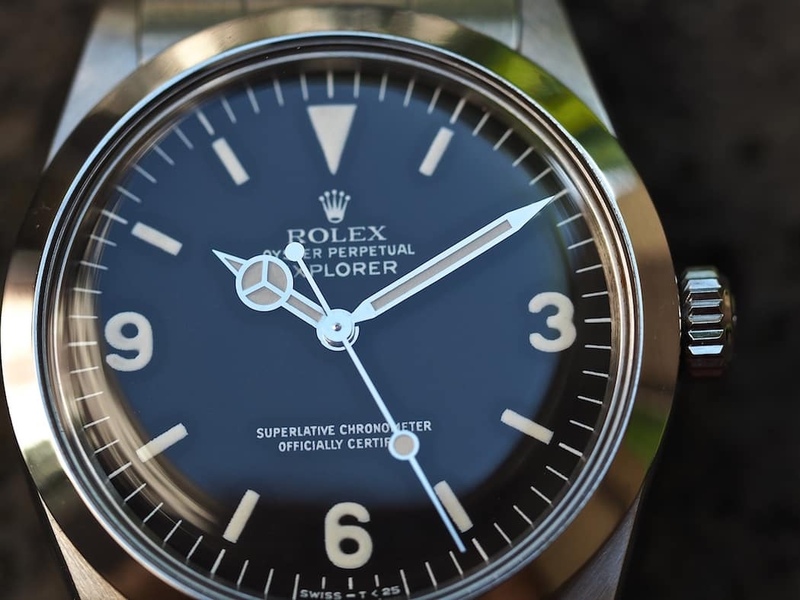 Does the minute hand need to extend right to the edge of the dial? Makes the hour hand look tok small by comparison. Shouldn't the minute hand just end once it brushes the start of the indices so you can easily read the time? I note the 1016 above does this. Touching as above would be good, the minute hand then reads so much better. Looks perfect now. I hope you're going ahead with this and that I can buy it in the not too distant future. One more thing, I believe the lug to lug should be 44mm, not 42,5mm. And I agree with Geralt about the length of the hour hand (1mm more) and second hand (counterbalance longer). Indeed, I really hope this goes ahead. Personally I could live with slightly incorrect hands. The dimensions of the case and dial are more important to me. If the lug to lug is changed to 44mm I believe this could be the most faithful 1016 homage out there. Me too. You need to make plenty of them Eddie and be prepared for the shop to be closed for a couple of weeks. I think this could be the all time legendary TimeFactors watch. The Everest was popular... this is looking to blow that out of the water!! Hands don't look quite right, yet. I agree. The minute hand is too long & shouldn't touch the markers. This thread is a perfect example of how you can't please everyone. So I'd guess the miyota 9015 at 26 mm will fit a 36 mm watch. Last edited by Passenger; 18th August 2018 at 10:50. Excellent! So are you going ahead with this? An if yes, any idea when we can expect it? I for one can't wait to put my order in. Regarding the hands, the length of the seconds and minute hands are correct as far as I can tell. I'm not sure about the hour hand but it's difficult to judge from a render. I have my own 1016 for reference. I think we should all be very grateful to Eddie that he produces great watches – and lets us kick them around before! These are my favourite threads on the forum. I think the new version is getting so close to perfection. My only comment would be to bulk the hour hand up a touch to balance out the set. Below is an example. My re-worked version from a week ago on the left > Eddie's new design in the centre > the new design with a slightly enlarged hour hand on the right. 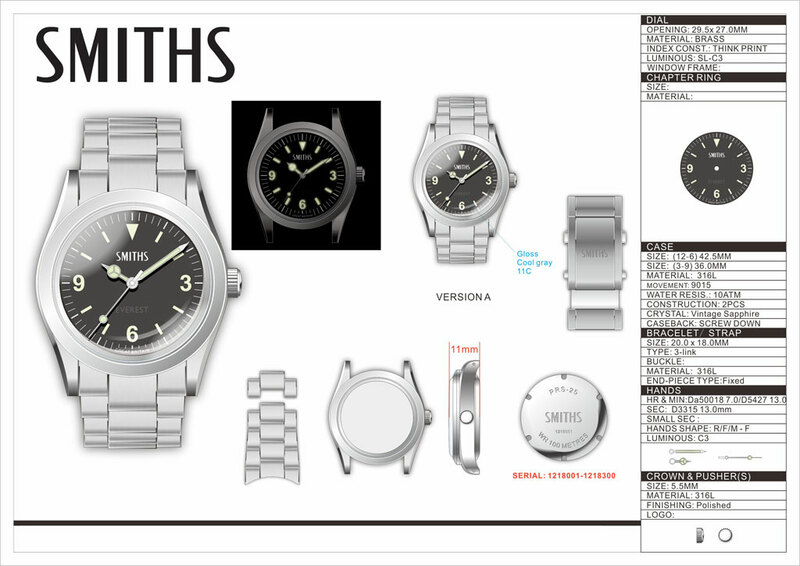 ... the new design with a slightly enlarged hour hand on the right. 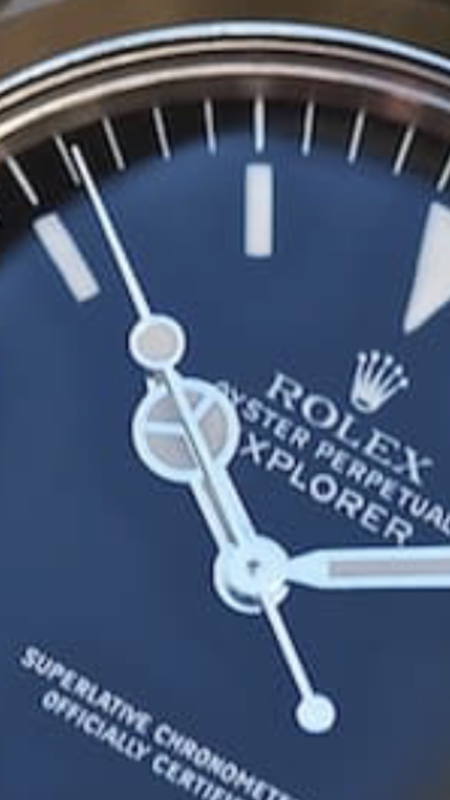 Does the lollipop ball on the 1016 seem further back from the hour increments and aligns over the arrow point of the Mercedes hand ? Eddie if you just make your PRS25 dimensions faithful to your 1016 i will buy it. Heck might buy 2 and keep one in reserve.